Have you ever had a creamsicle? They are orange popsicles filled with a creamy vanilla ice cream. The combination of the two flavors is delicious, and the acidity of the orange works extremely well against the rich center. I managed to become completely addicted to them one summer when I was in middle school and couldn’t eat another for several years afterwards. Fortunately, I never developed an aversion to the excellent vanilla-orange flavor combination. This cake uses the combination in both the cake itself and in the frosting. I filled it, on special request from a friend, with a very easy-to-make raspberry filling. The overall flavor was delicious (assuming that you like orange flavored things) and the cake was lovely: sweet and tender, with a slightly dense texture that made the cake feel homemade and satisfying. I particularly enjoyed munching on the scraps of orange cake while I worked on the frosting. I also really like the shape of this cake. I decided to bake a single cake in a 9×13-inch pan, then cut it in half to make the layers. I wouldn’t recommend trying to cut a cake this large in half lengthwise (through the middle) to create layers, as it would just be too difficult to handle the pieces, but slicing it in half straight through the middle produced layers for a not-too-large rectangular cake perfect for serving a smaller group of family or friends. Almost any frosting will work for this recipe, but I chose to use a simple buttercream as my base since it is easy to control the flavors and the consistency. Buttercream also worked well because I could make a lot of it, and this cake seemed to take slightly more frosting than some of the others that I have made recently. I used some of the frosting to thicken up raspberry jam for the filling and give it a similar consistency to the rest of the icing on the cake. That said, the fact that jam is added does make the filling a bit runnier than the frosting used to coat the outside of the cake. To prevent it from running out when the upper layer is set onto the cake, I simply pipes a border of plain frosting around the border of the lower layer before I filled it. This held the filling in place and let me spread the orange frosting on the sides of the sides of the cake without worrying about streaks of pink leaking out. Another option for the filling is to use curd instead of raspberry jam. Lemon curd mixed with a bit of buttercream to thicken it up is a great choice for many cakes, but in this case, you might want to try an orange curd or another berry curd. And, of course, you can use just about any type of jam you like if the orange-raspberry combination doesn’t float your boat. Heat oven to 350F and lightly grease a 13×9-inch baking pan (pyrex or metal). Whisk together flour, baking powder and salt in medium bowl. Set aside. In a large bowl, cream together sugar and butter until light and fluffy. Beat in eggs one at a time, beating well after each addition. Combine orange zest, vanilla, milk and orange juice in a measuring cup. Add flour mixture alternately with orange juice mixture to butter mixture in the large mixing bowl, beating well after each addition and ending with an addition of flour. 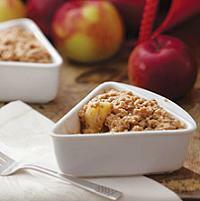 Pour batter into greased 13×9-inch baking pan. Bake for 45 to 55 minutes or until toothpick inserted in center comes out clean. Cool completely in the pan before frosting. In a large bowl, cream butter until smooth. Gradually beat in half the powdered sugar, followed by the vanilla, orange juice and orange zest. Add in remaining powdered sugar as needed (you might need a bit more if it is extremely humid or hot) until thick, creamy and spreadable. Remove 1/2 cup of frosting into a small bowl and mix with rapsberry jam. To frost the cake, divide the sheet in half and trim any uneven edges (such as the round corners, if you used a pyrex pan). Slice off the domed top of the cake to make the layers even. Feel free to eat the scraps while you work. Place one half of the cake on a serving platter. Fill a pastry bag with 1 cup of frosting. Pipe a border around the top edge of the cake on the platter. Fill in the top of that piece with the raspberry filling. Place second layer of cake gently on top. Frost sides and bottom with remaining frosting. Pipe borders on the edges of the finished cake, if desired. This is so lovely – I may even request it for my birthday cake from my fiance, as it looks pretty easy too! Wow, it really is a beautiful cake. This is a really beautiful cake! I just employed colored sugar to decorate a cake (a butterfly cake for my daughter’s second birthday) and felt as though I’d over done it, so it was really nice to see the elegant results of a moderate sprinkling. Love your site, by the way. I am a first-time visitor and appreciate anyone who can talk cookies and mojitos in the same blog. Perhaps you’d like to do a guest blog on Glam? We’d love to have you! I used to be a professional baker (and now I work in health care finance… go figure) and I absolutely rely on your website for exciting new baking ideas. I saw this recipe after you posted it last night and immediately made the cake. I “adult-ized” the cake by brushing the warm layers with a syrup made with Grand Marnier and used a vanilla bean French buttercream icing instead of the orange scented icing. I think I may fill the cake with chocolate mousse next time. Chocolate/orange is a truly winning combination. Anyway, I love your site; thank you! Oooh… Orange cream cake of tastiness. My dreams are actually coming true! okay. i’m totally making that, but in a gluten-free version. 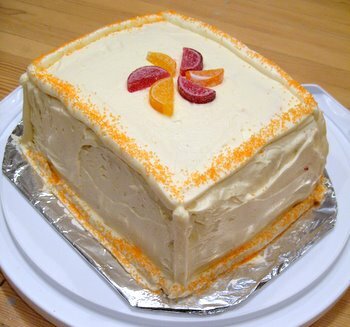 I love the look of this cake, love orange flavour .A birthday is coming up on the 30th I will be making it. I will let you know my results and post a picture. Capello — My daughter has Celiac… if you’re sucecssful with your GF version, I would love to hear about it! What a pretty cake–So cheerful looking! That was a cool one. I made it this weekend and it was a huge hit amongst my friends. Thanx a lot. I love creamsicles! This cake turned out great.